AFTER ALL, WHAT IS POETRY? BY JOHN RAYMOND HOWARD. Considering the immense volume of poetical writing produced, and lost or accumulated, by all nations through the ages, it is of curious interest that no generally accepted definition of the word "Poetry" has ever been made. Of course, all versifiers aim at "poetry"; yet, what is poetry? Many definitions have been attempted. Some of these would exclude work by poets whom the world agrees to call great; others would shut out elements that are undeniably poetic; still others, while not excluding, do not positively include much that must be recognized as within the poetical realm. In brief, all are more or less partial. Perhaps a few examples may make this clearer, and show, too, the difficulty of the problem. "Poetry," says Shelley, "is the record of the best and happiest moments of the happiest and best minds." But how can this include that genuine poetic genius, Byron, who gloried in being neither good nor happy? Lord Jeffrey, one of the keenest of critics, says that the term may properly be applied to "every metrical composition from which we derive pleasure without any laborious exercise of the understanding." In this category, what becomes of Browning, whom Sharp characterizes "the most profoundly subtle mind that has exercised itself in poetry since Shakespeare"? 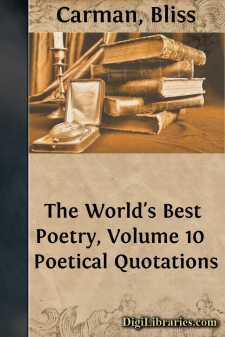 Wordsworth, who has influenced all the poets since his day, declares poetry to be "the breath and finer spirit of all knowledge; it is the impassioned expression which is the countenance of all science." Matthew Arnold accepts this dictum, and uses it to further his own idea of the great future of poetry as that to which mankind will yet turn, "to interpret life for us, to console us, to sustain us,"—even in place of religion and philosophy. And yet, some of the highest and finest of known poetic flights have been in the expression of religious and philosophical truth; while on the other hand Wordsworth's characterization of poetry turns the cold shoulder to that which is neither knowledge nor science, the all-powerful passion of Love—probably the most universal fount and origin of poetry since the human race began to express its thoughts and feelings at all. Coleridge enlarges Wordsworth's phrase, and makes poetry "the blossom and fragrance of all human knowledge, human thought, human passions, emotions, language." This is fine; yet it is but a figure, denoting the themes and ignoring the form of poetic production. Quaint old Thomas Fuller gives a pretty simile when he says that "Poetry is music in words, and music is poetry in sound"; and, in so far as melodious form and harmonious thought express and arouse emotion, he gives a hint of the truth.